Here are some snazzy birthday facts about 6th of May 1953 that no one tells you about. Don’t wait a minute longer and jump in using the content links below. Average read time of 10 minutes. Enjoy! What day was my birthday May 6, 1953? May 6, 1953 was a Wednesday and it was the 126th day of the year 1953. It was the 18th Wednesday of that year. The next time you can reuse your old 1953 calendar will be in 2026. Both calendars will be exactly the same! This is assuming you are not interested in the dates for Easter and other irregular holidays that are based on a lunisolar calendar. There are 18 days left before your next birthday. You will be 66 years old when that day comes. There have been 24,088 days from the day you were born up to today. If you’ve been sleeping 8 hours daily since birth, then you have slept a total of 8,029 days or 21.98 years. You spent 33% of your life sleeping. Since night and day always follow each other, there were precisely 815 full moons after you were born up to this day. How many of them did you see? The next full moon that you can see will be on April 19 at 11:14:00 GMT – Friday. Fun stat: Your first one billion seconds (1,000,000,000) happened sometime on January 12, 1985. If a dog named Thor - a Harrier breed, was born on the same date as you then it will be 312 dog years old today. A dog’s first human year is equal to 15 dog years. Dogs age differently depending on breed and size. When you reach the age of 6 Thor will be 42 dog years old. From that point forward a medium-sized dog like Thor will age 4.5 dog years for every human year. Spanish and German troops sack Rome; some consider this the end of the Renaissance. 147 Swiss Guards, including their commander, die fighting the forces of Charles V in order to allow Pope Clement VII to escape into Castel Sant'Angelo. Construction begins on the Grand Palace, the royal residence of the King of Siam in Bangkok, at the command of King Buddha Yodfa Chulaloke. American Civil War: The Battle of Chancellorsville ends with the defeat of the Army of the Potomac by Confederate troops. The Eiffel Tower is officially opened to the public at the Universal Exposition in Paris. George V becomes King of the United Kingdom upon the death of his father, Edward VII. More than 20 million viewers watch the first televised royal wedding when Princess Margaret marries Anthony Armstrong-Jones at Westminster Abbey. A jury of architects and sculptors unanimously selects Maya Ying Lin’s design for the Vietnam Veterans Memorial from 1,421 other entries. Former Arkansas state worker Paula Jones files a lawsuit against United States President Bill Clinton, alleging that he had sexually harassed her in 1991. The body of former CIA director William Colby is found washed up on a riverbank in southern Maryland, eight days after he disappeared. The Bank of England is given independence from political control, the most significant change in the bank’s 300-year history. Curious about this Perfect Gift Box? This is a party item you can activate and send to your friends when you play the free game Jump Birthday Party. It’s a fun and easy-to-play mobile game for all ages. Get free 1,000 gold coins when you download today! What does my birthday May 6, 1953 mean? Your birthday numbers 5, 6, and 1953 reveal that your Life Path number is 2. It represents balance, harmony and partnership. You have the soul of an artist. You are a fine companion and possess a good sense of humor. Friends seek you out for your calming and peaceful company. The following celebrities also have the same life path number: Carl Franklin, Yvon Deschamps, Yvette Nicole Brown, Fish Leong, Mary Treen, DJ Skee, Kundan Lal Saigal, Vivian Kubrick, Mirella Freni, Colleen Ballinger. 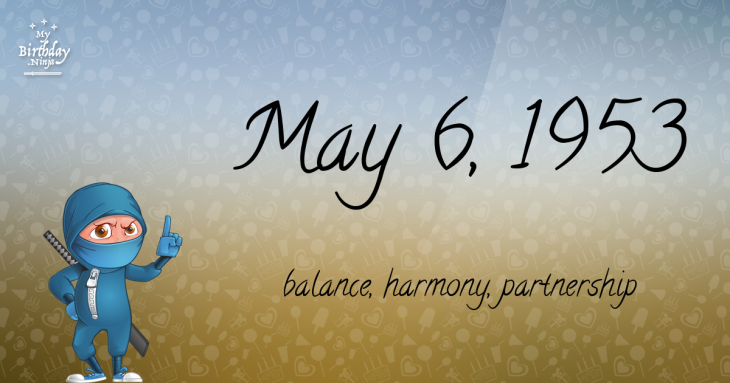 What is the birthday horoscope for May 6, 1953? The Western zodiac or sun sign of a person born on May 6 is Taurus ♉ (The Bull) – a fixed sign with Earth as Western element. The ruling planet is Venus – the planet of love and beauty. According to the ancient art of Chinese astrology (or Eastern zodiac), Snake is the mythical animal and Water is the Eastern element of a person born on May 6, 1953. Fun fact: The birth flower for 6th May 1953 is Lily of the Valley for purity. What is the Love Match for May 6, 1953? When it comes to love and relationship, you are most compatible with a person born on May 3, 1942. You have a Love Match compatibility score of +170. Imagine being in love with your soul mate. On the negative side, you are most incompatible with a person born on November 7, 1931. Your incompatibility score is -149. You’ll be like a cat and a dog on a love-hate relationship. Arf-arf, I want to bite you. Meow-meow, stay away from me! How many babies were born on May 6, 1953? Base on the data published by the United Nations Population Division, an estimated 97,861,773 babies were born throughout the world in the year 1953. The estimated number of babies born on 6th May 1953 is 268,114. That’s equivalent to 186 babies every minute. Try to imagine if all of them are crying at the same time. What is the popular baby name on 6 May 1953? Here’s a quick list of all the fun birthday facts about May 6, 1953. Celebrities, famous birthdays, historical events, and past life were excluded. 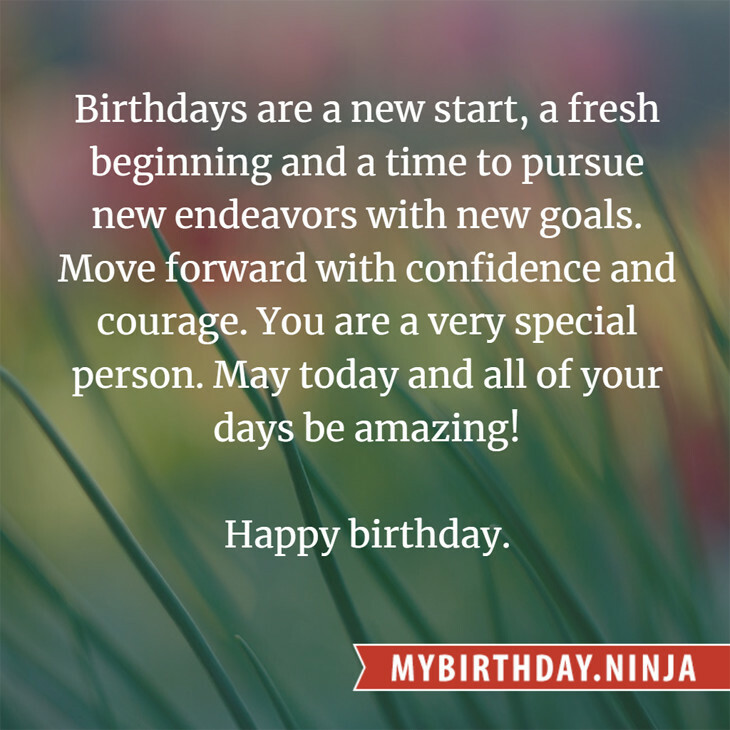 Try another birth date of someone you know or try the birthday of these celebrities: November 14, 1956 – Peter R. de Vries, Dutch journalist and producer; December 11, 1976 – Yujiro Shirakawa, Japanese actor; May 16, 1947 – Barbara Lee, American singer (The Chiffons) (d. 1992).